Precision Punch miniature ground components consistently exceed expectations while meeting the most rigorous requirements for precision-critical industries such as pharmaceutical, bio-tech, medical, micro-stamping, electronics and plastic molding that are built to exact tolerances and concentricity to provide superior alignment, better performance, longer runs, and less downtime. 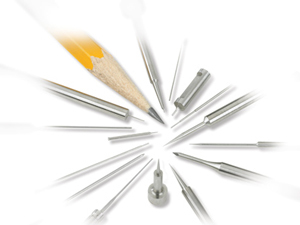 Our miniature punch, perforator, pin and custom or special ground component capabilities are available in diameters to.004 inches while holding tolerances to .0001 inches, point diameters to .004 inches along with surface finishes to 2 micro (Ra or RMS). It takes a full team of talent to build precision into the smallest miniature ground components for exacting industries such as pharmaceutical, medical, micro-stamping, electronics and plastic molding. Our state-of-the-art processes are designed by engineers who are dedicated to meeting the most rigorous specifications. Couple that with our highly skilled machinists working with the latest manufacturing equipment and you can be assured of uncompromised quality built into every piece, no matter how small (or large), time after time. We know that any custom product begins with you, our customer. We listen to you and learn from you. Our highly knowledgeable technical team provides support and guidance whether working on the simplest sketch or the most intricately engineered component. We have the experience and expertise to translate the specific expectations of designers, CAD operators and engineers into products that meet your precise needs. Our exceptional service and our technical know-how enable us to keep our quality high and your cost low. It’s no surprise that 80% of our business is generated from custom design orders. Whatever the size, shape, size or finish, we have the largest in-stock selection of high grade tool steels and stainless steels to meet your needs. We also have the ingenuity and innovation to produce parts from just about any other materials your designers request..